As I wanted to relax and take it easy I chose to ride Swiss national route 3. Route 3 starts in Basel and finishes in the Italian canton Ticino. 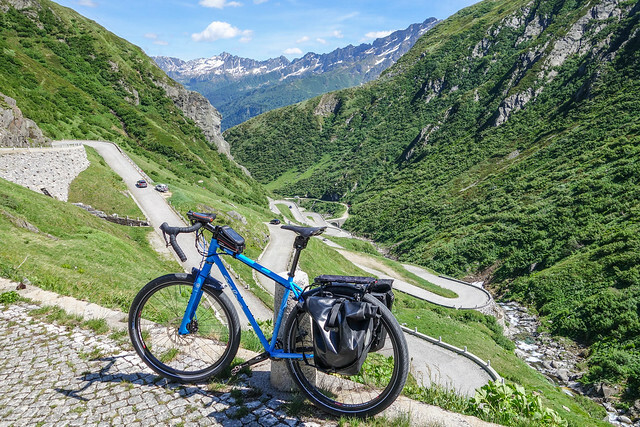 The distance was a tad too long for a relaxing 2-day ride so I skipped a section from Basel to Aarau and from Bellinzona to Chiasso. Furthermore, Bellinzona has great train connections. That was an additional reason not to go any further. Swiss rail system doesn’t allow to bring bikes on trains in the morning from 6 to 9 because of busy commuting. I obeyed the rule with pleasure and slept in. I didn’t start packing until I’ve had a delicious hot breakfast served by my DW and received all the presents. I have started the ride at 11:30. Probably the latest I’ve ever started. 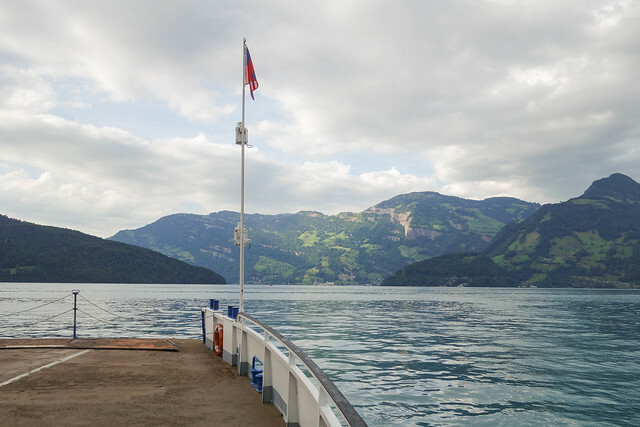 The ride from Aarau to Luzern was uneventful and serene. There was a lot of industry along the way and almost nothing to write home about. I kept a good pace and arrived in Luzern to meet my DW for lunch. We stopped in our favorite cafeteria that serves outstanding NYC-style pizzas, top-notch barista coffee and freshly baked deserts. I decided against any snacking or sport food during the ride. Real food is way better. I prefer to have proper meals every 3-4 hours than small caloric snacks every hour. Unfortunately, it’s rarely an option. The distance was just perfect. On day 1 there was almost no climbing. The total vertical ascent accumulated simply from small hills over the whole distance. 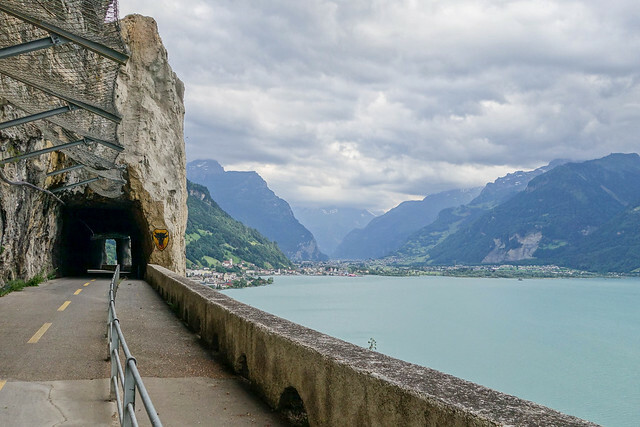 I crossed the Vierwaldstättersee lake with a ferry and continued along the lake through Brunnen (where the Zurich/Zug peloton group rides through) to Fluelen. The night before the tour I was debating whether to stay overnight in Fluelen or to come home and then get back on the next day. Staying overnight somewhere else alters the spirit of a tour. It feels like a small adventure whereas coming home feels like just another ride. I found a great little guesthouse in Attinghausen (Hotel Krone) for a very reasonable price. The weather, by the way, was perfect throughout both days. It didn’t get too hot and there was a nice refreshing tailwind. Day 2 started at a reasonable hour. 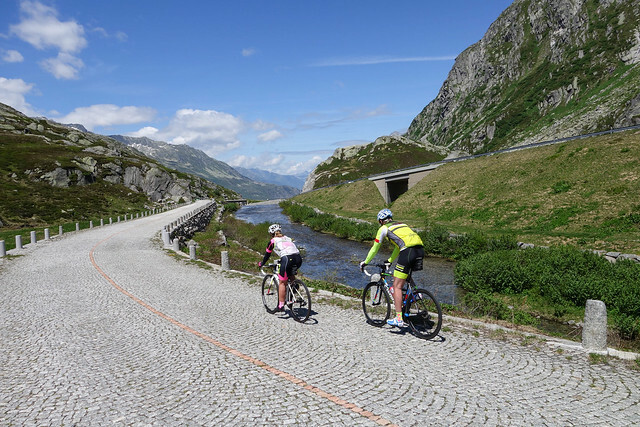 After eating as much as I could from the breakfast buffet I set out to the highlight of the tour - the Gotthard pass. The height profile resembled a pyramid. Roughly half of the day was up and the other half down. I think I prefer that to undulating hills. 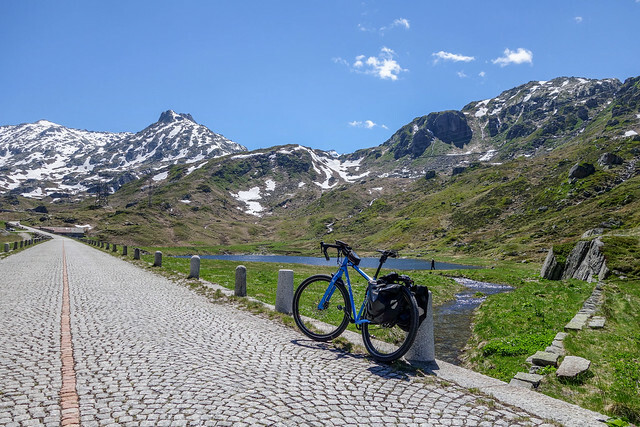 In any case, the road to the Gotthard Pass is under construction until 2018 and there are restrictions on the uphill bicycle traffic from Goschenen to Andermatt. It is closed to cyclists on most of the days but there are exceptions. I checked the official website in advance so I knew that weekend was open. An uphill ride is a rewarding experience. I can’t get enough of it. It takes patience and the right gears. The achievement feels ecstatic, especially when cyclists and drivers on the way down in the opposite direction greet and wave at you. They know you’re almost there! 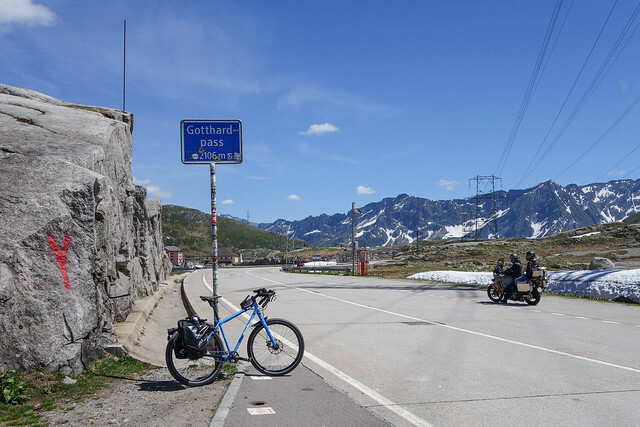 Following this ride I can claim that I covered the Gotthard Pass on a bicycle, car, motorcycle, feet and even rope (climbing). And of course every uphill battle is followed by a blazing descent. This descent lasted almost until Bellinzona. That was a nice finishing touch to leave a lasting positive impression from the tour. In fact, there were no problems to speak of. The comfort on the bike improved significantly as I reinstalled the Cane Creek Thudbuster seatpost. Rohloff has also performed exceptionally well after I’ve changed the oil and reduced the tension on cables. I think panniers are a bit of an overkill for a 2-3 day bike tour so I’m planning a new bike build. I’d like to build a faster and lighter touring drop-bar bike. I’m looking at bikepacking gravel bikes for inspiration. But the build has to wait until I trade a couple of bikes that I don’t use anymore. This was probably the best birthday ever. I’m grateful to my DW for letting me go alone and further making that weekend a real celebration. Not only we had a birthday breakfast and lunch but also continued with the festivity on Sunday with grilling on the balcony.